If you live for camping, but you don’t do winter camping, this can be the toughest time of the year for you. If you’re not into winter sports, we’ve officially reached the end of the outdoor season and that leaves the unpleasant task of packing up your gear. Packing away your camping equipment isn’t something you should do without a plan. You need to make certain that your gear is in the same shape when you unpack it in the spring as it was when you packed it. A.B. Richards can make things easier by providing a safe secure place to store your camping equipment. If you have something to store, A.B. Richards can give you a place to store it. We can make things very convenient for you. A.B. Richards has locations throughout the northeast and we’ll deliver your ground level portable storage containers to wherever you need them and we’ll also pick them up when you’re done. There are so many uses for our storage containers for both personal and business reasons. We can help you get ready for a move or renovation. Or we give you the ability to store equipment at your job site. If you need extra space for your inventory, come to us. We make storage easy and we want to give you some tips on storing camping equipment easier. As a general rule, your goal for storing camp gear is to make sure that everything you put into your storage container is clean and dry. But each component of your camping gear is different. KSL-TV gives a number of suggestions for storing of all of your winter gear. 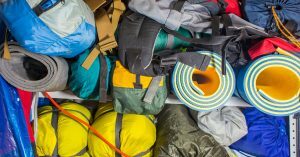 While tents, sleeping bags and backpacks tend to be the big items when storing camping gear, don’t forget to sweat the small stuff. Boys Life reminds you to remove batteries from flashlights, lanterns, headlights and any GPS devices you have so they don’t become corroded in the winter. It’s also essential that all of your cooking gear is well cleaned before you store it. If you run a scout troop or an outdoors club, A.B. Richards storage containers are ideal for storing your winter camping gear. If you run a seasonal business and need winter storage, we can accommodate you too. Whatever your storage needs are, contact A.B. Richards today.